Bogan Gate farmers and their trusty fourlegged companions were put through their paces at the Bogan Gate Sheep Dog School recently. With funding from the Red Cross Let’s Talk Program and Parkes Neighbourhood Central, the Bogan Gate Memorial Hall hosted expert sheep dog trainer, Rick Jones of Jones’ Silver City Working Dogs. Nine local farmers learned from Rick’s lifetime of experience breeding, training, working and trialling sheep dogs. Farmers were taught how to teach their dogs to balance stock, effectively use commands and how to bite and bark on command. According to Rick the working dog is the most valuable tool a farmer can have. “A good dog is a dog that I can send over the hill and he’ll bring back whatever I want without being told what to do. If they could open and shut a gate there wouldn’t be much need for the bloke,” he said. The farmers were suitably impressed with the skill and discipline on display from Rick’s dogs and the vast improvement in their own dogs. “I wish I had done this 20 years ago, there is a lot from this school I can take away when training my new pup,” said Chris Burke of Yarrabandai. Anthony McIntyre of Bogan Gate felt the same. “I bought my young dog Rocky along who hadn’t had any work over the last 12 months and by utilising Rick’s training methods he is the dux of the class. Rick says he isn’t a magician but he is pretty close”. “It is important for communities to band together during dry times and events like this help rural communities stay connected” said Peter Chapman of Red Cross. For Parkes Shire Drought Relief Officer Roger Kitson the event was a great example of bringing the community together while at the same time learning some great skills. The Parkes Phoenix Easter Colouring Competition was very popular. 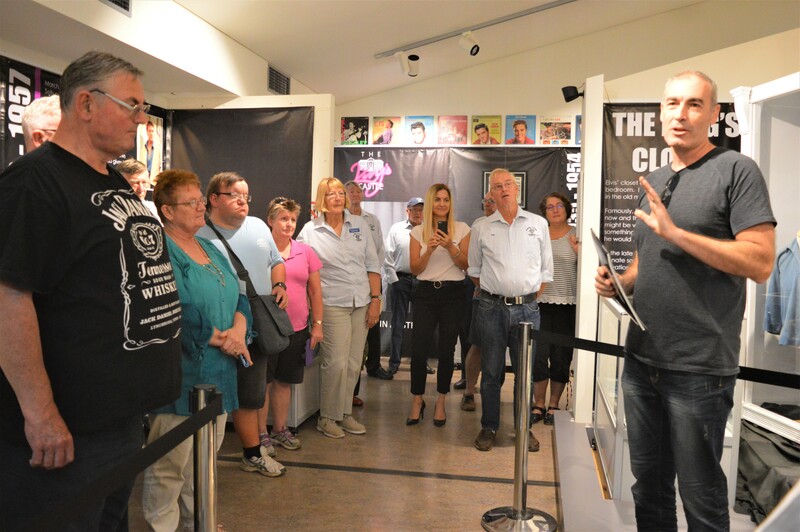 Thank you to the Parkes Shire Library for displaying the entries for the public to see. We had two winners, one for under five years, one for over 5 years. Four-year-old Elle Ballantyne was very excited to have won a prize for the very first colouring competition she has entered. 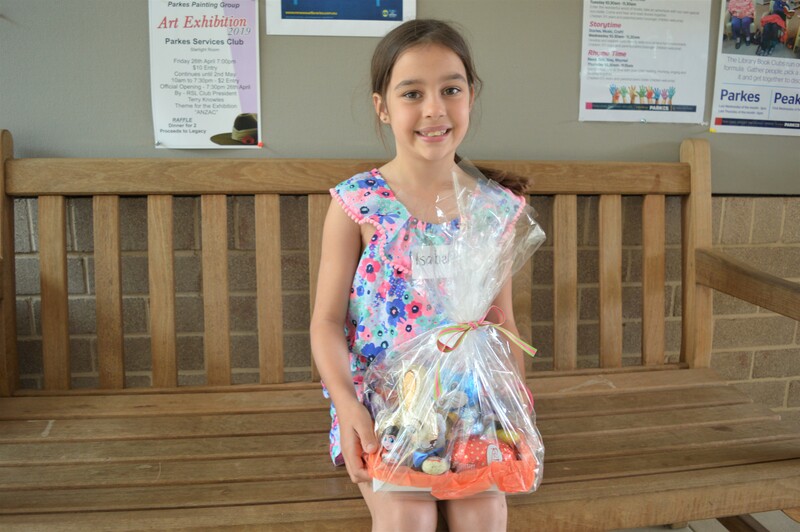 Isabella ten Cate da Silva (7) could stretch out her Easter celebrations when she received her prize of Easter eggs on Tuesday. 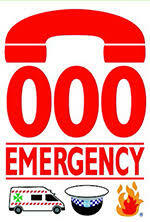 We all know we can call the 000 number for help in any emergency, and over 2 million people each year make that call. If you would like to give credit to and recognise the selfless and inspiring efforts of emergency services workers and volunteers, nominations are now open for the Rotary Emergency Services Community Awards. The awards recognise all six emergency services paid staff and volunteers who work in Fire and Rescue NSW; Marine Rescue NSW, NSW Volunteer Rescue Association, the NSW State Emergency Service; NSW Rural Fire Service and NSW Ambulance Service. “For much of the time these unsung heroes go about the business of dealing with a range of emergencies. And while we can’t live without them there aren’t too many opportunities to recognise them publicly,” said CEO of First State Super, Deanne Stewart who supports the awards. Nominations close on 1st May with finalists announced at Parliament House on 19th June, and the winners recognised at a gala dinner on 3rd August. As Parkes’s only surviving male World War II veteran Thomas Forrester was given the honour to lead the annual Anzac Day March as part of our town’s annual celebration. Tom led the march with the official Anzac Day special guest Lieutenant Colonel Dave Heatley. His daughter Narelle Sunderland escorted him in a wheelchair after the sprightly 97-year-old made it clear he did not want to ride in a taxi. Tom was born on 21st February 1922 in Forbes and served approximately four years in the Australian Army with the 2nd AIF in the 2/3 Australian Infantry Battalion and during his enlistment he served about 14 months in New Guinea on Overseas Active Service. In December 1941 Tom joined the 54th Battalion and in August 1942 the battalion was sent to Western Australia. From there he went to the Atherton Tablelands and completed a jungle training course before being sent to Papua New Guinea with the renowned 2/3 Battalion AIF. On 27 December 1944 Private Thomas Forrester arrived at Aitape, New Guinea from Cairns abroad the troopship Bentekoe. He fought in engagements along the coast in the 6th Division’s advance from Aitape to Wewak. Tom recalls the fight for But Aerodrome in March in which the 2/1st and 2/2nd Battalions were heavily involved. From the But area the 2/3rd advanced inland from the Coast along the Mabam River and on 2nd April two companies captured the headquarters of the Japanese 20th Division just east of the Wonginara Mission. In February 1946 he boarded the Duntroon and arrived home in Sydney on 1st March 1946. He left the Army in June 1946.